On 4/13/11 I was driving home from my Midnight Job at Cabelas in Dundee, Michigan. 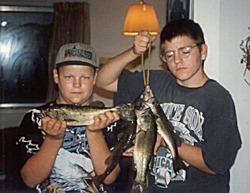 I had knew a couple of my buddy's had fished the night before. I decided to give my buddy Alex a call and get the fishing report. He had told me they caught 10 fish in 2 hrs with an 8lb average. This was a credible as a fishing report gets. 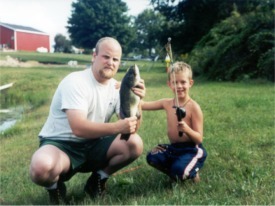 I talked to him and said I was thinking of going out and had nobody to fish with on such short notice on a weekday. He convinced me to go out alone that the fish were there and biting aggressively. That was all it took I was on my way to get my boat and 18 ft crestliner sportsman with a 40 horse tiller drive Johnson equipped with a Minnkota bow mount trolling motor. I launched right around 7:00 out of Elizabeth Park in Trenton, Michigan. After a short boat ride, I was into my first drift. After 2 hours and 3 drifts of watching boats all around me net a few fish here and there I was still empty handed. With a 42 degree surface temp and sunny clear skies with a light wind, I knew the fish were here and was determined to catch a walleye that morning. It was about 10 minutes into my first drift about 9:30am as I moved into about 10 ft of water when my line was pulled down. Immediately set the hook with my personalized St. Croix Avid Spinning rod which is a 6'6" MH. The weight on the other end of the line was heavy as if I were pulling a log off the bottom. As the fish came to the surface I looked over the side of the boat to see the largest walleye that I had ever seen on the end of my line! When the fish came to the surface we met eye to eye. She then took of to the side of the boat all I could do was hold my rod tip straight to the water hoping my 8lb flame green berkly fireline and 10lb vanish leader would hold to this fish pull. As I prepared the net hanging off the side of the boat I brought her to the side a 2nd time was then that I saw my 1/2 orange and black 2 tone gumball jig tipped with a 4" gulp smelt colored minnow in her mouth. Then she ran again and again I was holding my rod tip straight to the water letting the drag spool off of my Shimano Sonora spinning reel. She ran about 15 ft off the side of the boat, as she stopped I lifted the rod and slowly brought her back toward the boat. When she came back to the boat she was coming along the surface right to me. I held the net in front of her, pulled her head into the net and kept pulling until tail was almost in and then scooped. She was in the net! I was shaking and having uncontrollable heart palpitations. I tried to lift the net into the boat with 1 arm but could not make it. I then set my rod down pulled her into the boat. I initially I did not know how big it was I knew it was gonna be at least a 12 pounder until I had went to a fellow anglers boat and asked to use a scale. 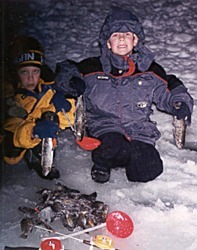 Then we were in amazement the fish was tipping between 15 and 16 lbs. Wow I thought to myself. It was then when I knew I had to have this river monster officially weighed. A guy whom I knew on the water told me that Bottom Line bait and tackle had a certified master angler scale and I took it there after I pulled the boat out of the water. After putting in the scale at bottom line it weighed out to 15.9lbs which converts to 15lb 12oz. After filling out the master angler application and freezing the beast for the taxidermist. 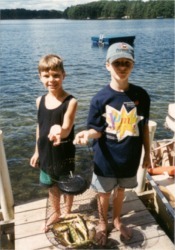 I went online to the Michigan DNR website to look at the master angler entries. 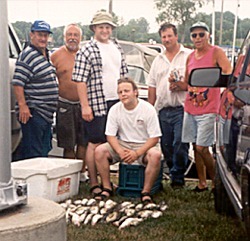 To my knowledge and research this had been the biggest walleye being reported being caught in the Detroit River since 1994 which is as far back as the websites records show. 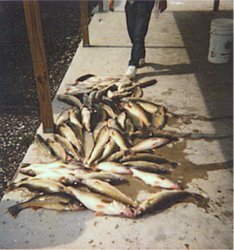 There are so many anglers that travel here from out of state every year and just so many people that fish this tremendous fishery each year for this to be the heaviest walleye caught in 15year is absolutely a fish and accomplishment of a lifetime. Rich Arch, fishing manager at Gander Mountain Port Huron caught this 22 inch 4.5 lb smallmouth on fish stalker mother of pearl at Cedar lake. 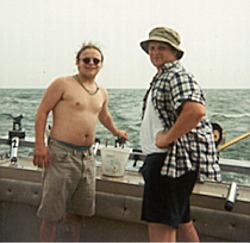 Here's a couple of pics of a trip Dave and Aaron and I took out to the Saginaw Bay. 18 feet of water, 2oz bottom bouncers, 2mph, GSI crawler harnesses about 50 feet behind the boat. The purple with white spots and a kind of yellow stripe was the most effective this spring/summer. I also got a master angler class sheephead (freshwater drum over 26 inches) that was quite a bit of work to reel in. Joshua Grapentin at Hume Lake in California - Caught in May 2010. Josh Caught his limit everday! Praise God! 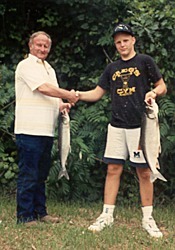 I was the guy that caught the muskie last saturday (02-20-2010). That was a great tournament and I think you guys did a great thing with the kids, we can't do enough to get them involved in the sport we love so much and you guys went above and beyond the call of duty with the prizes and making it fun for everyone. 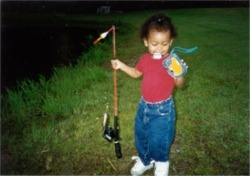 I'm an avid fisherman and I'm on the water rain or shine at least 3 days a week and I'm looking forward to checking out your website to see what you have. I mainly fish for walleye in the river and Lake Eerie and panfish in the winter and between my website partners (fishing buddies) and I we spend a lot of money on tackle. Check out our website when you get a chance and see what were about. If you want to use my picture for your packaging I would be honored and maybe you could send me a handful of stickers for us to put on our boats to help you out a bit. Our website is hothuntingspots.com and my nickname is the 3" Magnum you will see my report and others on the fishing reports link. I haven't had a chance to make my weekend report yet but hopefully tonight I will. I look forward to hearing from you. The fish were Walleye, Perch, Crappie at Houghton Lake Labor Day weekend 2009 caught with home-made in-line spinners using Grapentin Wonderbread Blades. Here are the photos from our league. Both of these large mouth bass are around 4 lbs. each. (One is 4 lbs. even, the other is 3.89 lbs.). 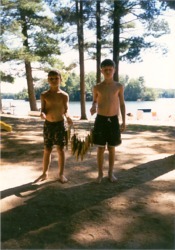 We caught them using the drop shot minnows on Woodland Lake (near Brighton, Michigan) on July 28, 2009. 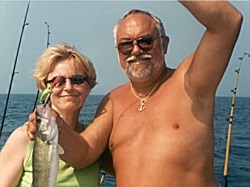 Pete and Sandy Cappai with Cheryle Barret, pictured, with Chuck, David, and Brandon, not pictured, caught these perch on Lake Erie 10-05-08 using Ritas's triple slammer and Josh's double Whammer. 275!, We kept only the 9- 14 inchers. All the dinks got got thrown back to catch again this winter. 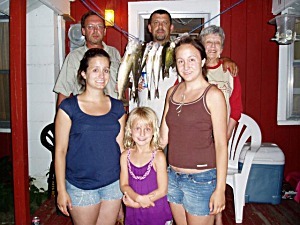 Caught in June 2009 by Jeff Grapentin and Jamie Fritz in the St. Clair River using nite stalkers and fish stalkers whippin! 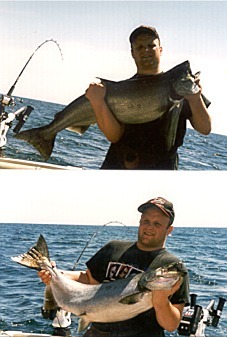 We caught these March 05, 2009 on Lake Erie using jigging rapalas. We were jigging them off the bottom. The one guy was using Grapentin perch rigs Three of them got their limit." 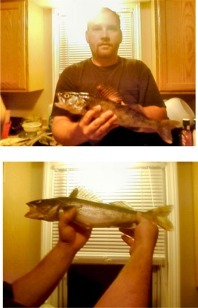 I caught this walleye on Aug. 29th 2008 in the Flint River near Flushing Twp. It measured in at 17" and weighed close to 3lbs. I used a 3", single #2 hook walleye rig I made myself using nothing more than 15lb. test line, red and green translucent beads and 2 swivel spoons. The water was about 4' deep and I set the hook about 10' off shore. 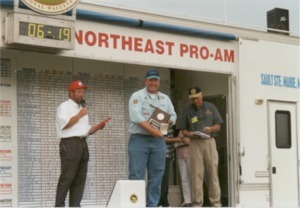 I have personally fished and wrote about the Michigan Walleye Tour since the very first event in 1996 and now fish the In-Fisherman Professional Walleye Trail. More MWT events (including the 2000 Michigan Walleye Tour Championship), have been won with Catchmore baits and Grapentin products than any other company. Many of the successful anglers that are using Grapentin products are now fishing the In-Fisherman Professional Walleye Trail. If you're a recreational angler or an up and coming pro, Grapentin products will help you put more fish in the liverwell day after day. Caught this 19" 4 1/2 lb. Large Mouth Bass (12 1/2" gerth) on 09-03-00 at 5:30 pm. I caught this big fish on a #6 Chart Flutter Snell, I almost lost him because he went into the weeds, I didn't think I'd get him back... but I did!" 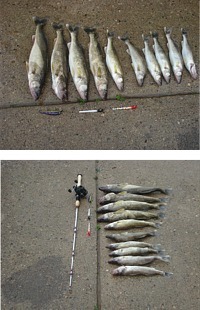 Caught at Fisherman's Marina (Detroit, MI) using Catchmore Crawler Harness 36" (DR-1) all within three hours. 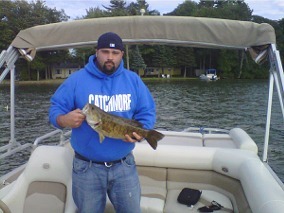 Caught at Turtle Creek (Oak Harbor, OH) using Catchmore Harnesses. Caught this Panfish on a #6 Chart Flutter Snell. Caught this Crappie on a #6 Orange Flutter Snell on Lakeville Lake. His mom, Donna Grapentin, makes all of our Flutter Snells. 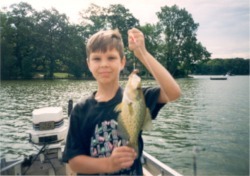 Caught this bunch of Perch and Panfish using Catchmore® Perch Rigs size 6 on Spider Lake (Traverse City). 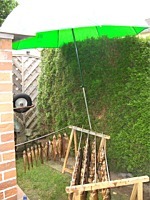 Their Grandma, Rita Purdon, makes all of our Perch Rigs. 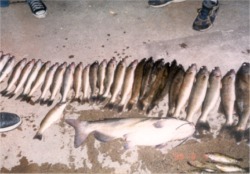 These were all caught on two different days at Spider Lake (Traverse City). With a catch off Lake Erie! 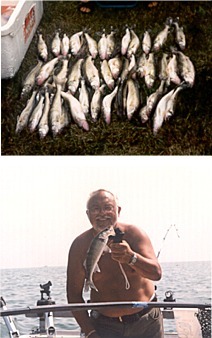 Walleye's caught while fishing with Captain Dan. 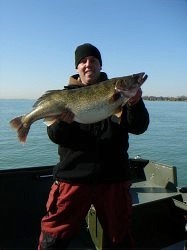 If you want to catch Walleye, catch up with Dan, he always gets his fish! This 34 lb. 12 oz. 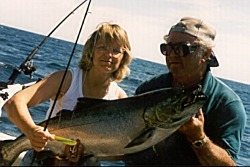 King Salmon was caught on Lake Ontario. This summed it up for our limit while fishing Lake Ontario. 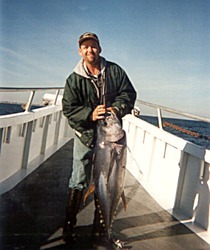 Long time friend, Dave Barrett of New Jersey, with a Great Tuna! Another long time friend, John Barrett of New Jersey, with this Salmon. 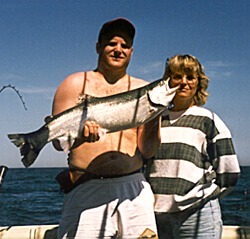 Caught this Steelhead on Lake Ontario. 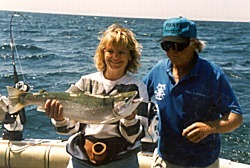 Diane Grapentin & Captain Keith "Pirate Lady"
While fishing on Lake Ontario, Diane caught this King Salmon. It took about 35 minutes to reel in but boy was it worth it. 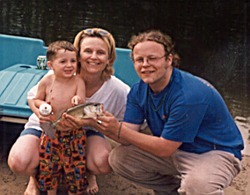 With a days catch of Small Mouth Bass using our famous flutter snells. 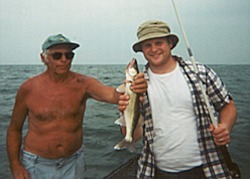 Caught these Walleye drifting on Grandpa's boat on the St. Clair River. 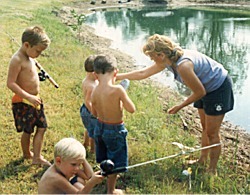 Diane Grapentin teaching her nephews to fish. Diane with her favorite Captain! Captain Dan. 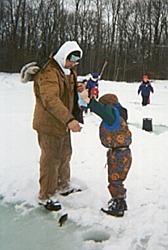 Fishing New Year's Eve - Jacob's first time ice fishing. 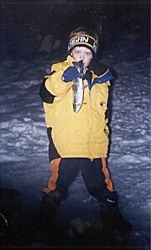 Caught this Rainbow Trout at this first attempt at ice fishing this year. He cleaned them, ate them and is now on his way to becoming a Grapentin spokesman. 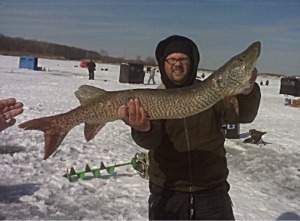 Caught on a Catchmore ice jig #31 using a Schooley rod. 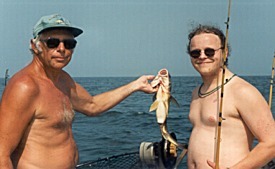 Jeff Grapentin's Grandfather was an avid fisherman his whole life. 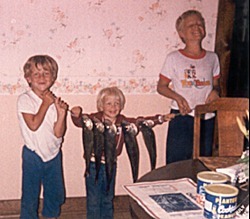 Show off their "Proud Catch" for Dad. 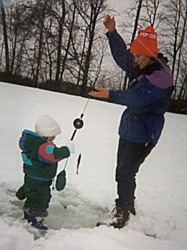 Rebekah caught 3 large Blue Gill at her first ice fishing attempt. Congratulating each other on a successful catch! 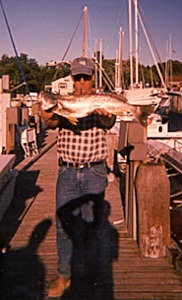 Shows off this Lake Trout caught in Lake Huron while fishing with J-Lynn Charters of Almont. When it comes to fishing Walleye - Joe's one of the best! Jon caught this Sheephead while fishing for Walleye. 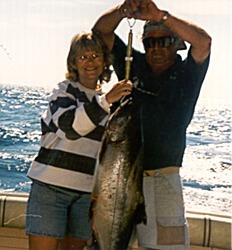 Diane Grapentin with Captain Keith of "The Pirate Lady" with a King! Proudly show off Ben's catch! 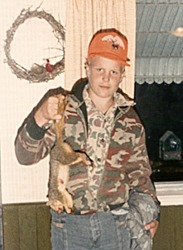 We promote hunting and fishing - this was Joshua's first squirrel shot at Uncle Martin and Aunt Donna's house in Leonard, Michigan. 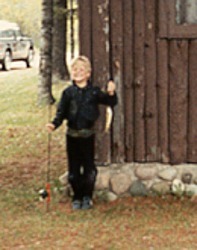 With a Perch caught at Grandma & Grandpa Creger's cabin on East Twin Lake in Lewiston. 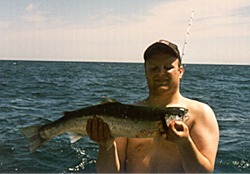 This Lake Trout was caught on Lake Huron while fishing on J-Lynn Charters.